Switch back and forth between reading the Kindle book and listening to the Audible book with Whispersync for Voice. Add the Audible book for a reduced price of $9.49 when you buy the Kindle book. Robert Fagles, winner of the PEN/Ralph Manheim Medal for Translation and a 1996 Academy Award in Literature from the American Academy of Arts and Letters, presents us with Homer's best-loved and most accessible poem in a stunning modern-verse translation. "Sing to me of the man, Muse, the man of twists and turns driven time and again off course, once he had plundered the hallowed heights of Troy." So begins Robert Fagles' magnificent translation of the Odyssey, which Jasper Griffin in the New York Times Book Review hails as "a distinguished achievement." Fagles has captured the energy and poetry of Homer's original in a bold, contemporary idiom, and given us an Odyssey to read aloud, to savor, and to treasure for its sheer lyrical mastery. Renowned classicist Bernard Knox's superb introduction and textual commentary provide insightful background information for the general reader and scholar alike, intensifying the strength of Fagles's translation. This is an Odyssey to delight both the classicist and the general reader, to captivate a new generation of Homer's students. This Penguin Classics Deluxe Edition features French flaps and deckle-edged paper. 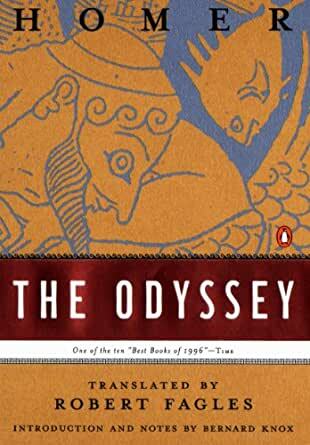 Robert Fagles's translation is a jaw-droppingly beautiful rendering of Homer's Odyssey, the most accessible and enthralling epic of classical Greece. Fagles captures the rapid and direct language of the original Greek, while telling the story of Odysseus in lyrics that ring with a clear, energetic voice. The story itself has never seemed more dynamic, the action more compelling, nor the descriptions so brilliant in detail. It is often said that every age demands its own translation of the classics. Fagles's work is a triumph because he has not merely provided a contemporary version of Homer's classic poem, but has located the right language for the timeless character of this great tale. Fagles brings the Odyssey so near, one wonders if the Hollywood adaption can be far behind. This is a terrific book. Robert Fagles's 1990 translation of The Iliad was highly praised; here, he moves to The Odyssey. As in the previous work, he adroitly mixes contemporary language with the driving rhythms of the original. The first line reads: "Sing to me of the man, Muse, the man of twists and turns/ driven time and again off course once he had plundered/ the hallowed heights of Troy." Hellenic scholar Bernard Knox contributes extensive introductory commentary, providing both historical and literary perspective. Notes, a pronouncing glossary, genealogies, a bibliography and maps of Homer's world are included. REVISED 11/07/16: Homer's ILIAD should be read by every literate person who strives to be well-educated, and Caroline Alexander's 2015, modern translation is an excellent way to read it. It is sound, solid, clear and direct, and respectful of Homer's original. Her English syntax is natural and flowing, understandable but not (as in some other recent, modern versions) flippant or too colloquial. I rate the translation 5-stars, though I was initially tempted to rate this ebook edition of it at least one star lower because of its formatting. As very good as Alexander's translation is, this ebook edition doesn't do it justice with regard to its textual formatting. Between indents and long-line carry-overs, the left margin unevenly zig-zags in-and-out on a Kindle screen. Just when I thought I had it figured out some double-indents appeared to add to the confusion. Sadly, downloading a sample won't reveal this; the sample will only provide pages from the Introduction, whose modern prose is quite properly and comfortably presented. It is the poetry of the ILIAD itself whose indented lines are so annoyingly erratic, and this will only be evident to those who actually purchase it and read beyond the sample. Interestingly, in the very first few screens of this ebook (which do appear in the sample), a note from the publisher appears concerning this matter, apparently recognizing it as a possible source of confusion but essentially saying (in effect) that's how it is on a small-screen device, it's the nature of the beast, and readers must try to get used to it. And so I am trying, mollified somewhat by the fact that I paid only $.99 for it -- rather than $14.99 (its original price) -- during a special sales-promotion period. But more importantly, I have since discovered the formatting is IDEAL if the text is viewed in wider-screen, landscape mode on one's Kindle device. 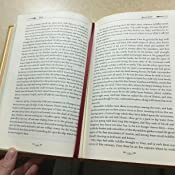 If you are able to make that adjustment (something my Kindle Paperwhite could not do until the last upgrade), the formatting problem is virtually solved and the long lines appear comfortably normal. There have been numerous translations of the ILIAD in recent years, but while I suspect in time many of them will fall by the wayside, this one may not. Caroline Alexander's stands a good chance to remain, not only because it is THE best among most recent ones, but because it is ONE of the best among ALL translations of the ILIAD. But great though it is, it will survive in the economic marketplace only if it is competitively priced with those others. Happily, its ebook price has come down from $14.99 to $12.99 and more recently to $8.99 (making it a strong contender). Caroline Alexander is also the author of THE WAR THAT KILLED ACHILLES: THE TRUE STORY OF HOMER'S "ILIAD" AND THE TROJAN WAR (Viking Penguin, 2009). 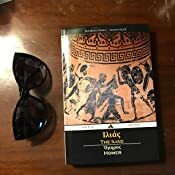 Those who enjoy her ILIAD may wish to read it. FYI: The first translation of the ILIAD was by George Chapman (1611), a formal and majestic Elizabethan English version in verse that is of interest today mainly in connection to its role in literary history. Two, free, public domain versions by Edward George Geoffrey Smith Stanley Derby (1862) and by Theodore Alois Buckley (1873) are pretty unpleasant to read; skip them. It's probably best to also steer clear of one by William Cowper (1791). Two old translations that remain popular, are easy to obtain in public domain editions, and ARE worth reading are by Alexander Pope (1715-20, in verse) and Samuel Butler (1898, in very readable prose). A once highly regarded one by Andrew Lang, Walter Leaf, and Ernest Myers (1883) was used by the Modern Library until replaced by Ennis Rees' wonderful translation (1963), my favorite. The best ILIAD translation is arguably by Richmond Lattimore (1951) with Robert Fitzgerald's (1974) being a strong contender for second-best. A 1938 one by W.H.D. Rouse is serviceable and generally okay. Likewise, Robert Graves offers a novelized version (1959) that is very readable but not a strict translation. Three excellent newer ones are by Robert Fagles (1990), Peter Jones (a superb 2003 revision of E.V. Rieu's popular 1950 version), and this one by Caroline Alexander (2015). Peter Green's highly literate translation (2015) is technically excellent but not as readable as the three just mentioned. Several other good, recent ones are by Michael Reck (1994, but now hard-to-find), Ian Johnston (2006), and A.S. Kline (2009). Three recent ones that I don't particularly care for are by Stephen Mitchell (2011, who omits too much textual content), Stanley Lombardo (1997), and Barry B. Powell (2013). These are just SOME of the other translations available. This review is now attached to OTHER editions by (perhaps) OTHER translators; hopefully they will be identified in the Kindle Store blurb so you can choose a good one (and avoid Lord Derby's, which I have rated 2-stars). Disappointingly, the AmazonClassics edition does not identify its translator (seemingly Derby, but in any case, just as bad), though it HAS added line numbers. Faithfulness to the original language AND readability are what one seeks in any translation of the "Iliad," and the translator must strike a proper balance between the two. 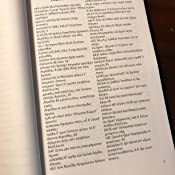 Greek sentences are structured differently from English sentences, and adhering too strictly to Greek word order and syntax will result in very awkward English. Throw Homer's poetic form into the equation and the result can be a very unreal English syntax. The translator has to determine what Homer said and meant (back then) in Greek and decide how BEST to communicate that to us (today) in English. There is no particular virtue in reading a sometimes convoluted Elizabethan or Victorian rendering of the "Iliad" in iambic pentameter or heroic couplets (since Homer used neither) unless one especially enjoys reading such. In fact, foundational differences in the two languages prevent a true equivalence in English of Homer's original poetic structure in Greek; that is the reason why many translators, considering any such versification to be artificial at best and dishonest at worst, render this work in prose. But at the very least Homer's poetic form was comparatively simpler and his linguistic expression was more direct than some older translators using English poetical formats make him seem; that is why other translators now often choose free verse as being an acceptable alternative to either complex metrical forms or prose. Of course, being readable or "understandable" is not the same as being "easy," and being too simple or too contemporary is no more of a virtue than being too difficult or too old-fashioned; rendering Homer's Greek into remedial-reader English or today's slangy vernacular is inappropriate, inaccurate and does the modern reader a disservice -- so one must choose one's "Iliad" (and one's translator of it) very carefully (a task not made any easier by countless Kindle Store editions -- like the one from AmazonClassics -- whose blurbs fail to identify the translator, or which seem to describe one translation but actually provide another). Below (in no particular order) are various translations (most, but not all of them, good) that I have read and can personally attest to. Several are available as ebooks; others may have to be obtained new or used in paperback or hardcover. Some adopt a poetic format; the others (which I have specifically indicated) are in prose. (1) Robert Fagles' 1990 free verse translation from Penguin is particularly readable (and the introductory information by Bernard Knox is invaluable). Perhaps due to its having been somewhat over-hyped, academicians now seem less enthralled by it than they once were, some on the grounds that Fagles does not always strictly adhere to Homer -- but usually that claim is made when comparing Fagles' to more literal translations, ones that are more scholarly but much less readable. I find his version quite sound, and I (and many others) still like it. I think it merits serious consideration as an excellent first choice and a contender for favorite translation. (2) E.V. Rieu's original 1950 prose version (from Penguin) was very understandable but in some specific instances treated Homer a tad too freely. This has been remedied in the present prose version, expertly updated by Peter Jones in 2003. I liked the original very much, but I like the update even better. This is also a very good first choice and a favorite of many. (3) W.H.D. Rouse provided a sometimes loose but generally serviceable, 1938 prose rendering which was long available as a popular, low-priced paperback. At one time this self-proclaimed "plain language" version was widely used in many public schools because it was inexpensive and considered easier-to-understand than other (pre-1938) versions then available; with newer versions today, that ease is debatable. An ebook edition of it as a Signet Classic from Penguin is currently available in the Kindle Store. (4) Ennis Rees' refreshing, 1963 free verse translation from Random House/Modern Library is my favorite and not too dissimilar in style from Fagles' but (perhaps) more straight-forward. 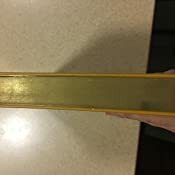 At present, it may not be easy to locate a copy outside of a used book store since it seems to be out-of-print. (5) Michael Reck's 1994 version, from HarperCollins, stresses its adherence to the oral tradition and is an honest, solid, respectful, and understandable translation. Though it seems to be lesser known, it is faithful to the Greek yet with comfortable English syntax. It also is not easy to find; an ebook edition, available when I originally wrote this in 2012, has sadly since disappeared from the Kindle Store. (6) Alfred Hurd Chase & William G. Perry Jr., wrote a prose version in 1950 once available in paperback from Bantam and used in schools. I haven't seen this lately, but it is very readable, and I treasure my battered old copy. (7) Richmond Lattimore's VERY accurate 1951 translation is published by the University of Chicago. It is much heralded but more scholarly and more difficult to read than other modern versions; it is widely regarded as THE very best translation. While I recognize its true greatness, it is not my favorite due to its awkward English syntax (making it, for me, a chore to read). (8) Robert Fitzgerald's 1974 translation from Doubleday is very highly regarded, but it is not an easy read. Many names are spelled less familiarly (such that "Achilles" becomes "Akhilleus"). I have a love-hate relationship to this version. It would not be my first choice for story comprehension and ease-of-reading, but its rich visual imagery and keen word-play amply reward anyone willing to make the effort to read it and devote the time to fully savor it. As I become disenchanted by the shallow simplicity and flippancy of some newer translations, I find this one becoming ever more appealing to me. After Lattimore, this is generally regarded by many as the second-best translation. (9) Robert Graves made an exciting novel-like, prose "translation" in 1959 titled "The Anger of Achilles" which is literate, generally respectful to the original, and particularly enjoyable. This lively version is great fun to read -- though debatably not a "true" and proper translation -- and an ebook edition will be found in the Kindle Store. (10) Stanley Lombardo's well-received 1997 translation is one I didn't fully read, because what I did read of it didn't impress me. Both in tone and in linguistic style, I found it to be an odd and inconsistent mix of formal and informal, noble words and deeds juxtaposed with jarring colloquialisms. I am probably in the minority, but I did not like this version. (11) Alexander Pope's classic version (1715-1720) is arguably more Pope than Homer, though some people love his heroic couplets, and it IS truly a poetic masterpiece in its own right. For many Pope fans, THIS is the one and only "Iliad," and if Homer didn't write his this way, he SHOULD have. (12) William Cowper's 1791, blank verse version demonstrates, by comparison, just how good Pope's is. Cowper's rendering results in awkward English syntax that is not as much to be read as deciphered. When I have to mentally re-translate a translation, I seek another. (13) Stephen Mitchell's 2011 translation demonstrates that being new and easy isn't necessarily always better. Like Lombardo, he uses too much inappropriate and sometimes jarring colloquial English, but unlike all the others, he expunges quite a few sections (and one entire book) of traditional text he feels are post-Homeric additions. (But what if he is wrong?) Given the accretive nature of this epic at virtually every stage in its development and transmission to us, this excision seems ill-advised. Being thus different in material-content from ALL the others, this ipso facto abridgment causes it to be something of a secondary or niche translation. (14) Andrew Lang, Walter Leaf, and Ernest Myers rendered the "Iliad" into late 19th century, "modern" English in their 1883 prose version. Although slightly old-fashioned in style, it is quite readable and has a reputation for accuracy. My copy is an old Modern Library Giant. (15 & 16): Two new translations currently available in the Kindle Store, one by Ian Johnston (2006) and the other by Barry P. Powell (2013), I have only sampled. I found nothing dramatically wrong with either of them, except a colloquialism or two in Powell's that seemed incongruous to me, such as when he has Agamemnon say to his men, "So don't rub me the wrong way" (Book 1, Line 33). Both pass muster in that Homer is generally honestly and powerfully rendered, but I personally don't care for Powell's translational flippancy and style. Neither translator offers a significant qualitative improvement over other recent translations, though Johnston comes close, and I prefer him to Powell. (17) Caroline Alexander's 2015 translation from HarperCollins DOES offer a superb and significant improvement over other recent translations, and I highly recommend it. Without a doubt the best among new ones, it is also superior to many old ones. Though solid and true to Homer, her English syntax is direct and natural, never flippant or colloquial. The ebook formatting of its long lines, necessarily divided on small-screen, Kindle-type devices, is uneven and distracting -- but that is easily remedied by switching to landscape mode. (18) Peter Green's 2015 translation, published by the University of California Press, is rightly praised for its faithfulness to Homer's Greek (not unlike Lattimore) and its lush poetic imagery, but because of that, its English syntax is not always as smooth or direct as might be desired. Nevertheless, it is superior in many ways to other recent versions mentioned above (by Johnston, Lombardo, Mitchell, and Powell), but NOT (in my opinion) to Caroline Alexander's (which I find more readable). (19) A.S. Kline's 2009 translation provides a version for the average, non-specialist reader and is currently bargain-priced at only $1.99, but his heavy use of commas offsetting every phrase makes for choppy reading. (20) George Chapman was the first translator of Homer, and his formal but majestic, Elizabethan verse edition of 1611 was (and by some, still is) highly regarded. Today, its interest to us is more in the realm of literary history than as a practical choice for general reading. (21) Theodore Alois Buckley's public domain version (1873) is no better than Lord Derby's, and like it, should probably best be avoided. (22) Samuel Butler's sturdy, 1898 prose version is worth considering (and I will say more about it below as a public domain alternative to Lord Derby's). The above list is by no means complete -- there are MANY others -- but it hints at the number and variety of translations that exist. Each of these translations (whether prose or poetry) has particular strengths and weaknesses as well as supporters and detractors, and none is perfect. That, not unexpectedly, creates some robust debate among readers of them. But, in my opinion, most of them are preferable to the public domain version by Lord Derby. I would certainly encourage you to consider trying some or all of the above, but I might suggest (purely as a practical and inexpensive starting point) the public domain, prose translation by Samuel Butler, available for free from various online sources. A free verson may not be currently offered in the Kindle Store, but several well-formatted editions are sold there for as little as $.99, and for that low price some even include Butler's translation of "The Odyssey." Although a well-known, late 19th century translator of Homer's two epics and the favorite of many readers, Samuel Butler isn't necessarily the scholar's favorite, and (like virtually every other translator of Homer) he has a few idiosyncrasies [see the NOTE below]. Therefore, he may not be considered the "best" translator from an academic perspective, but Samuel Butler's English IS straightforward, comparatively easy-to-read, and appropriately majestic but quite understandable; you will certainly be able to better appreciate and enjoy the drama and sweep of the "Iliad" in HIS version rather than struggle with the awkward English of Lord Derby's. NOTE: One of Butler's idiosyncracies (which is by no means unique to him) is a preference for using the names of Roman deities rather than the Greek (as in "Jove" rather than "Zeus"). He did so because he felt readers of his time were more familiar with the Roman names; today, the opposite is true. I do, however, own two hardcovered editions of Butler's translation in which all the Greek names have been restored, so presumably there MAY be a similarly treated ebook available (though I haven't yet found it). Not all (nor even, most) Greek names have been so treated by Butler; "Achilles," for example, remains "Achilles" (though "Odysseus" does become "Ulysses"). But for most readers the occasional appearance of a Roman name should prove to be little more than a minor distraction from an otherwise enjoyable text. Since no translation is perfect, at least this imperfection is quite bearable. ADDENDUM: Today the distinctions between poetry and prose treatments are fading due to the replacement of old, rigid metrical forms with new, free verse translations that are as direct, pleasant and comfortable-to-read as their prose counterparts. By going with the flow and reading the text as written, adhering to punctuation, pausing at commas and stopping at periods, but NOT slavishly and artificially stopping at the end of lines UNLESS punctuation dictates, readers should find in these free verse translations language as natural and understandable as that contained in prose versions. With so many wonderful translations currently available (whether in prose or in poetry), NOW is truly a great time to find and read an "Iliad" that's just right for you. My children tell me this poem is not required reading in school any longer, but then it wasn't when I was in high school in the 1970's either. Western Civ was crammed into a semester. Understand who and what you are in an hour a day over a term. Yeah I am sure that is going to work out. But I got a drivers license and that at least identified my gender. Otherwise lost in this age I decided to go back to the beginning, and like our hero depart this never never land the nymph Calypso tells me I am in where all is beautiful and there is no mortality. Ulysses knows who he is and leaves, preferring humanity. In contrast we are unmoored from all we have been before. We have no epic mythology that tells us who we are. Instead we are informed by the cyclops television, desktop computer or smart phone. How reliable are the stories these things tell live by? What I learned from Ulysses was I had the power to sharpen a stick and poke these monsters in the eye. Then set sail for Ithaca.